Featuring brass flame arrestor dasher screens and pump assemblies and comply with OSHA standards. 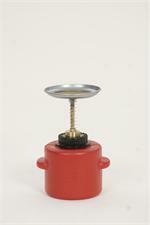 When the dasher plate is pushed down, the safety can dispenses a small amount of liquid to easily moisten sponges or rags without messy or dangerous spills. Metal - Red Bench Can 1 Qt. Metal - Red Bench Can 2 Qt. Metal - Red Bench Can 4 Qt. Metal - Red Bench Can 6 Qt. Metal - Red Bench Can 8 Qt. 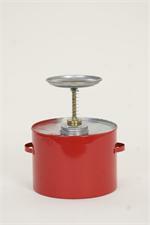 Metal - Red Bench Can without Lid 6 Qt. Metal - Red Daub Can 1/2 Pt. 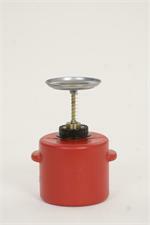 P704 EAGLE Safety Plunger Cans 4qt. Polyethylene - Red 1 Qt. Polyethylene - Red 2 Qt. 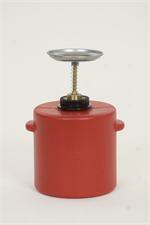 Polyethylene - Red 4 Qt.